Senior Season approaches! And me just out of the PPA’s Super Monday Lighting seminar. I was looking for an opportunity to test out some new approaches for metering, white balance and lighting. Julia volunteered to be my model. In this image, we had a simple two light setup. One softbox to camera right, a reflector off of the subject’s left, and a hair light to back left of camera. 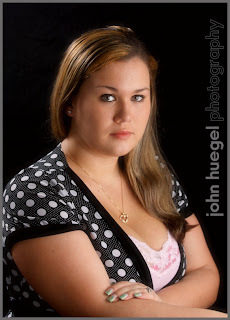 You can see the great light coverage from the softbox, and the nice rectangular catchlights in Julia’s eyes. We used a plain black background to keep the setup simple. Our practice session took us indoors and outdoors. We managed to wrap up our session just before the rain and wind came. Perhaps I’ll feature an outdoor image as well in the upcoming days. Great images, Julia! Thanks for being my test subject. All you Juniors out there…start thinking abour Senior Photos this summer! This entry was posted in lighting, Senior by admin. Bookmark the permalink.